If you don’t use Snow Leopard’s assistance, you’ll need to use Dynamic Host Configuration Protocol (DHCP) for automatic IP address assignment. DHCP is a protocol that enables a computer to automatically get all the information it needs to communicate across a network. Before you can use DHCP, you have to add a DHCP server, which provides other computers on the network with their configuration settings. Here’s the good news: Most Internet connection-sharing hardware devices (and software-sharing implementations as well) provide a DHCP server as part of the price of admission. Most wired and wireless routers can provide DHCP services these days. If you plan to use Internet connection sharing or you know that you have a DHCP server on your network, you can set up your Mac to automatically obtain the required IP address and information. Open System Preferences from the Dock or the Apple menu and choose Network. 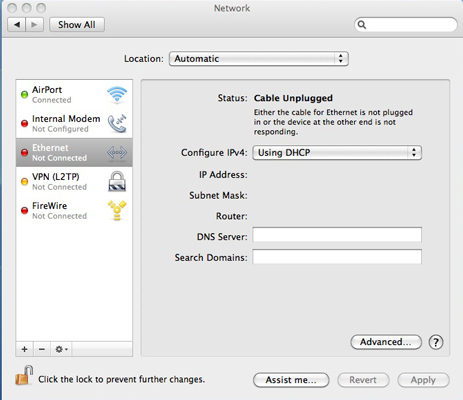 From the Network dialog that appears, click the Ethernet entry in the list on the left. Choose Using DHCP from the Configure IPv4 pop-up menu. Click Ethernet and choose Using DHCP. A few seconds after clicking the Apply Now button, you should see the information come up, as provided by the DHCP server. This lets you know that the process worked and configuration is complete. You might also notice that the DNS Servers information is empty. Fear not: Mac OS X is really using DNS information provided by the DHCP server. Press Command+Q to quit System Preferences and save your settings. If you ever make a network change that screws things up, such as entering the wrong subnet mask or an IP address that isn’t in the same range as others on your LAN, you can always click the Revert button to get back your old settings.